Thinking about a getaway for a long weekend or a short holiday? Think no more because that is the place you are looking for. 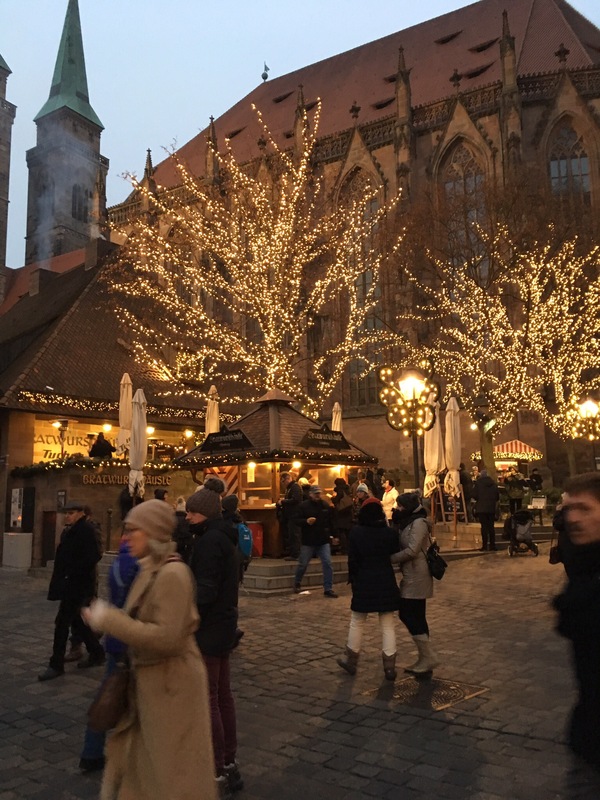 Especially during the Christmas season, Nuremberg is a special treat for your eyes and taste buds. The city has a lot to offer, no matter if you enjoy history, Christmas markets or the best beer you can find. 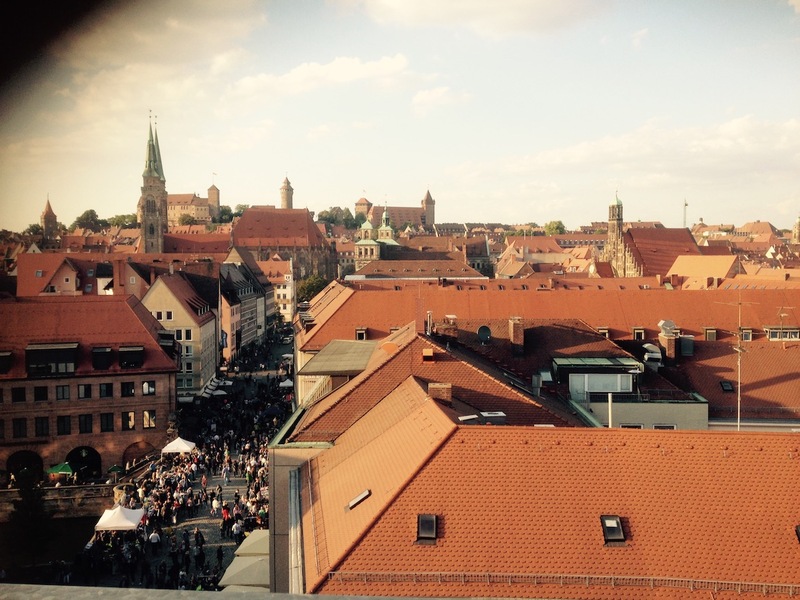 Find your guide on how to spend a long weekend in Nuremberg here. Nuremberg is easy to reach by train, plane or bus, not by boat though but you can take a car. There are cheap flights from a lot of places around Europe or connecting flights if you come from further away. If you fly here from Malta you get the perfect connection with Ryanair, flights go on Fridays and Tuesdays. Here is a little something about the city in case you have never heard of it before we get to the itinerary. Nuremberg is a city in the southern part of Germany in the beautiful region of Franconia. On the map, it might look like Nuremberg is part of Bavaria, but never ever tell a Franconian that. The city was founded around the year 1000 and first mentioned in a document in the year 1050. It got really important during the Middle Ages as a trading city and the place where the emperors held there first Imperial diet. The city was directly under the emperor’s rule and got very rich and popular during that time. Moreover, it was located on the silk road and a popular trading place. The city was home to artists and inventors like Albrecht Dürer or Martin Behaim. And Nurembergers invented the gingerbread (Lebkuchen). Unfortunately, there is a rather sad chapter in the city’s history, that is connected to Nazi Germany and World War II. Because of its power and special status in the Middle Ages, Hitler made Nuremberg to an important place for his rule. That is the reason why the city was destroyed almost completely during the second world war and the famous Nazi Trials were held there. You can actually visit the courtroom. 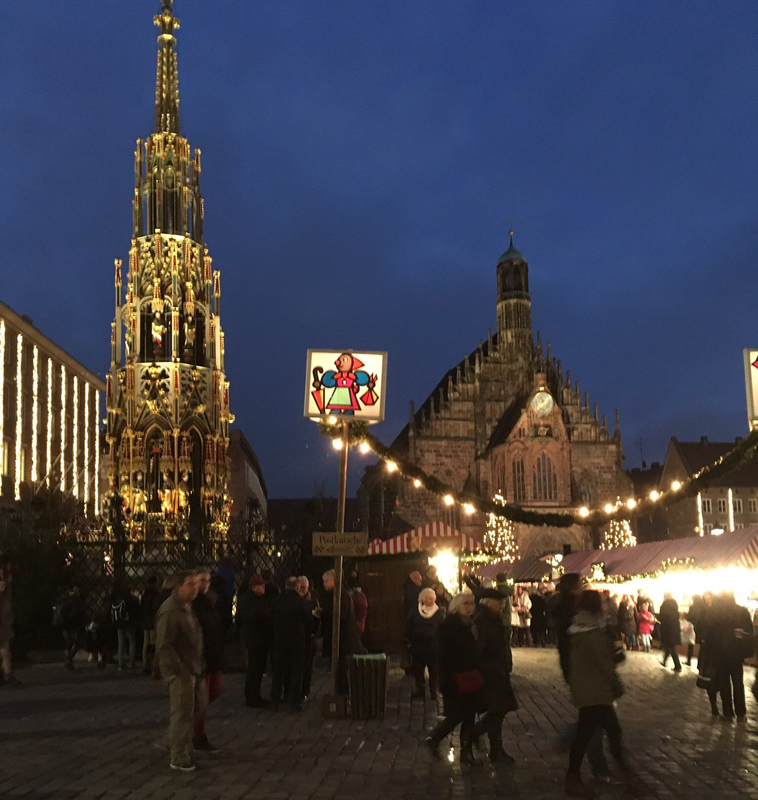 After the bombing, Nuremberg was rebuilt and his iconic medieval charm is recreated and it has a lot of nice places to visit, to hang out and to enjoy. The city has a pedestrian zone all over the city center and a castle overlooking the whole place. If you want to learn all about the history of the city you should visit the Fembohaus, it is the city’s museum and an old tradesmen’s home. On your first day, let the city center amaze you and wander around the small alleys and visit the castle. Start your day with breakfast in the hotel, bnb or at the Café Alex, right at the main Market (Hauptmarkt). It is a nice place with a breakfast buffet overlooking the Christmas market. Perfect to kick your weekend in Nuremberg off with style. Start your tour walking up to the castle, make sure to take the side alleys so you don’t miss them. Make sure to visit the castle and go up to the Sinvell Tower to overlook the city. Take the audio guide and visit the deep fountain, it is worth it. Make your way back down to the main market and have a special “3 im Weckla”(the famous sausages in a bun) in the Bratwursthäusle right in front of the city hall. It is a cozy place and has the best authentic treats. 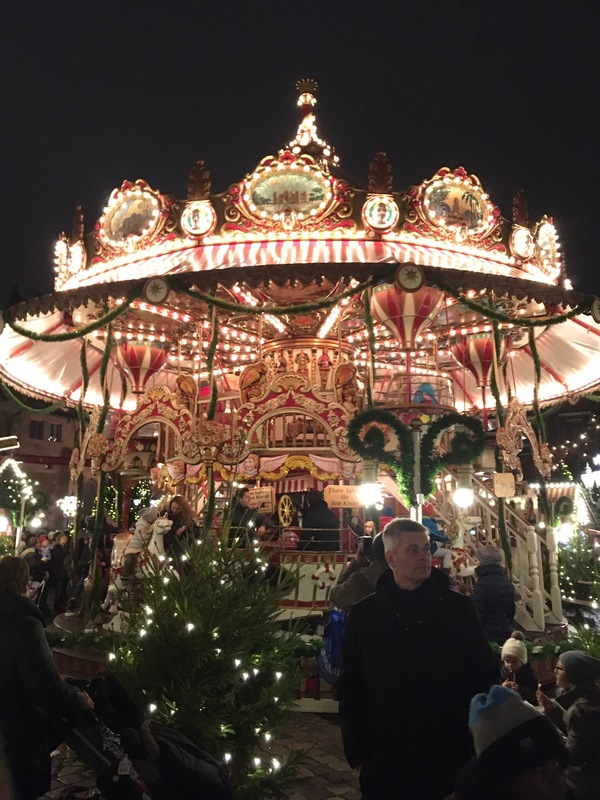 Take your time to wander around the Christmas Market after that and have some Glühwein after that. Make sure you also visit the children’s market with his classic and beautiful carousel. And the market of the sister cities to discover a lot of different cultures in one square. End your day with some authentic Franconian beer (we even have glutenfree ones). This takes you out of the city center to the part that was important to Nazi Germany. If you come from the city center it is easiest to take the tram(8) or the bus (36) or the train (S-Bahn 2) to the Dokuzentrum. 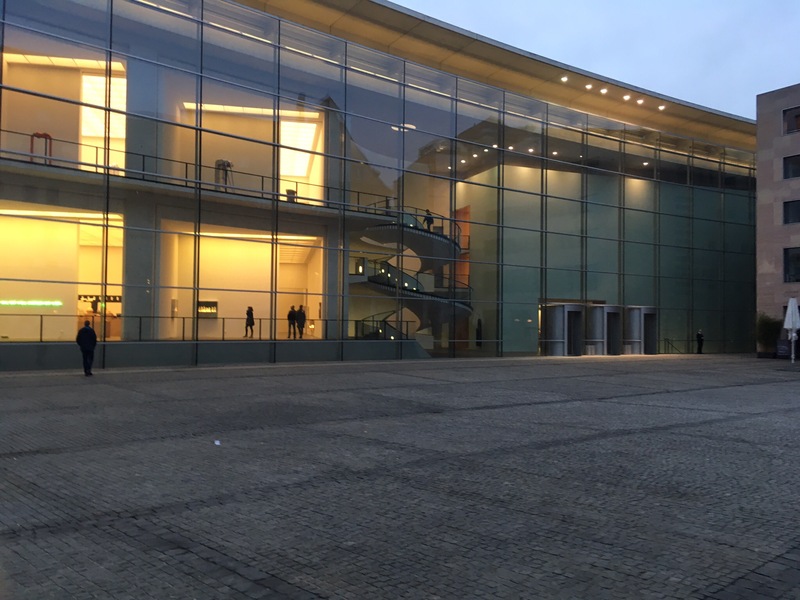 The Dokuzentrum is also the place where you should start your visit, it is a museum of the Nazi history, it is very interesting and a must see. Now that you are informed take a walk through the Nazi Party Rally Grounds, follow the documentation on the boards all around the area. Prepare for a long walk, but it worth it. Also, it is good to know that where you are walking the festival Rock im Park is held in summer. A good use for those grounds. Finish your day in one of the great Restaurants the city has to offer. * There will be a separate post about that. And of course some great Franconian beer. Again in the city center make your way to the Abrecht Dürer Haus and the Fembohaus. They are not just great museums but you get the change to see the old houses from the inside. They provide perfect explanations for life in former times. In front of Dürer’s house, you can also find a beautiful small square with a great place to have a beer of coffee right inside the city wall. After that make sure to visit some of the gingerbread shops and get a souvenir tin box for your family. 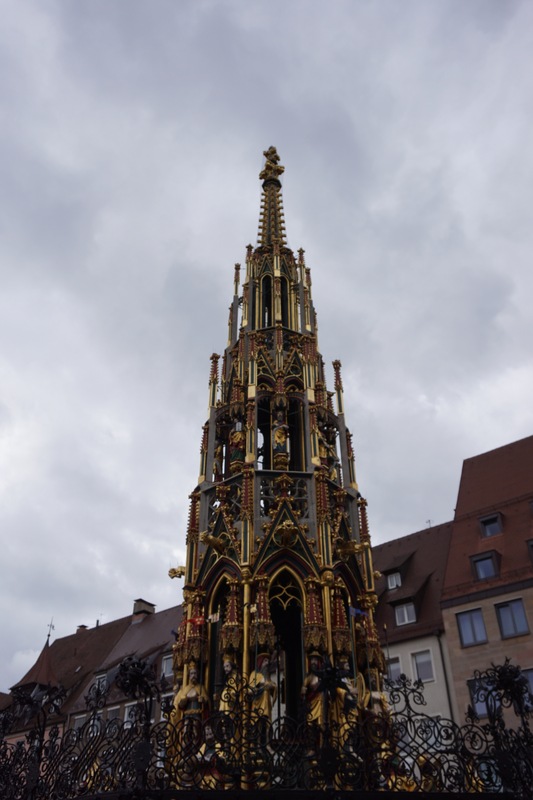 Now it is time to visit the Schöner Brunnen (beautiful fountain), it is located on the main market and one of the most famous attractions in the city. You will find a golden ring, turn it 3 times, that means good luck! Take some time to visit the Churches that are masterpieces of Gothic or Roman architecture, visit St Sebald, Lorenzkirche and Frauenkirche. The last one is also located on the main marked and has a special treat every day at 12 o’clock. The famous Männleinlaufen is an old mechanism that shows the 7 great electors offering gifts to the emperor. If you are looking for more museums in the area visit the Toy Museum, it is not just a delight for kids. Nuremberg used to be and still is famous for manufacturing toys. Finish your with a walk through the cozy Handwerkerhof and have a look at the unique artisanal crafts. Also, you can have a great Franconian meal there. Although there are still a lot of historic sights left, you should dedicate a day to rather modern sights. One example is the Neues Museum, a museum of modern art and an interesting architectonical sight. Then take a stroll through Nuremberg’s hipstery district Gostenhof, visit the small shops and galleries there and get an idea of the different side of the town. As you are close you can visit the courtroom of the Nazi trials as well. Finish your day with a meal at the Schanzen Bräu Brewery, to food goes best together with their great Rotbier. You won’t regret it. There is a lot more to see so there will be more posts about this beautiful city. One special tip for a great view: Go inside the “Adler Parkhaus”, a garage close to the Main market, go all up to the last floor parking deck and enjoy the view! Already as a little girl, I was bitten by the travel bug and will most likely never get rid of it. I love to travel and to understand other cultures and languages. After living in Cuba for a couple of years showing the beauty of Havana to others, it was time to pack my suitcase and move on. I keep traveling and am currently based in Malta writing about all sorts of travel adventures and other stuff. I love to travel slow and engage with the local culture. I'm Ines. German passport holder but at home in the world. Getting to know places from a local perspective. Always curious. Digital nomad and bitten by the travel bug. Slow traveler. Joyful soul! 2019 - Ines Bahr - www.beinglocallyabroad.com. All Right Reserved.